Makeover Madness - TPT Seller Challenge - All Things Special Ed. I hopped right on the bandwagon and joined the #TPTSellerChallenge for this summer! 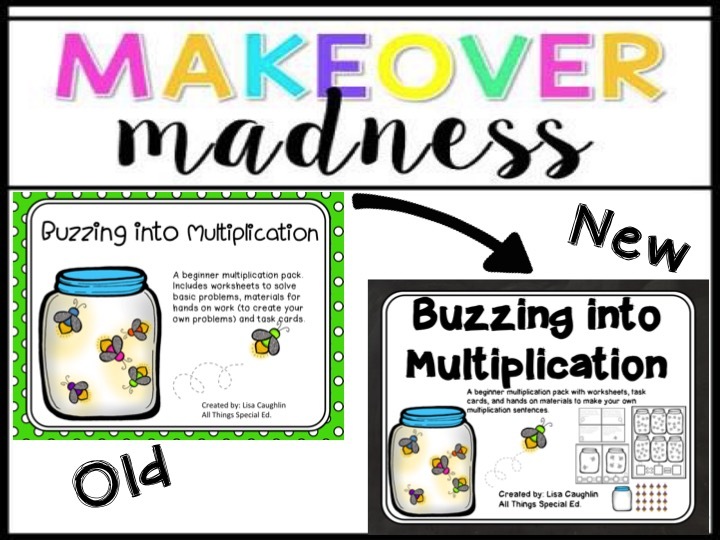 The seller challenge is being hosted by Teach Create Motivate, Peppy Zesty Teacherista, Sparkling in Second, and Third in Hollywood. Feel free to check out one of their blogs to read all about it! This week (week 1) we are to makeover one of our products. This could be updating clip art, changing fonts, or simply redoing a cover on a product. Well since I only have one product... 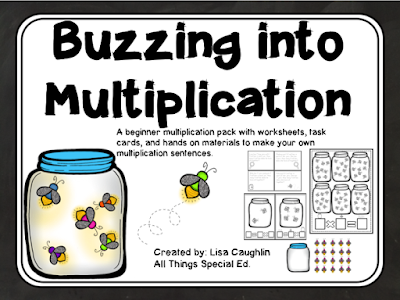 I made over my cover page for my "Buzzing into Multiplication" pack. I don't think the first cover was bad, but I knew I wanted to add in a preview of what was inside this packet so that was the first thing I changed. Then I made the font thicker, increased the size then I changed the background color from green polka dots to black chalkboard. I like how it turned out and the black really helps the color pop out at you. If you would like to check out this product click on the picture- don't forget to try it out with the free sample! I love how you included a few page examples on the new cover. That gives the buyer a quick look! I love how bold the new cover is. It will definitely stand out more. Very Cute. The update looks great! I think the title is much more noticeable now! 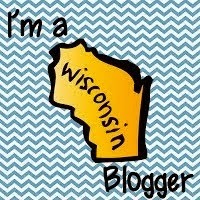 Your blog is the cutest and this update, a nice touch with the added visuals of the product! Way to go! Is your wish list or cart ready?? © 2015 All Things Special Ed. . GLS Felicity Template • Customized by A Bird in Hand Designs • All rights reserved.